Usually when we are travelling I write a blog for each day, but this stay at Cholsey Grange has coincided with a busy spell of work. It fits in perfectly for me because I can take the dogs for a few miles in the morning, come back and feed Jackie’s chickens and Perkins the cat. I am not a usually into cats, mainly because I am allergic to them, but strangely I look forward to seeing Perkins in the morning. We generally have a chat about our plans for the day, which is a one sided conversation with Perkins telling me to stop blabbering and get on and feed him! Lynnie is still fully ensconced in the Olympics so is happy for me to wander off with the boys leaving her to fully concentrate on winning gold medals. This afternoon it is cracking weather, just right for a walk and Lynnie is persuaded to join the boys and I on our afternoon stroll. We leave Cholsey Grange CL by walking up the farm drive and then cross the road to join the road that passes Hellcorner Farm, we continue straight on to join a signed bridleway as it enters trees. As this track sweeps to the left we turn to the right to join a footpath that heads downhill to a stile with a dog gate alongside it. Ideal you would think, however some thoughtful soul has decided that when fencing this section they would run the sheep wire right across the dog gate. 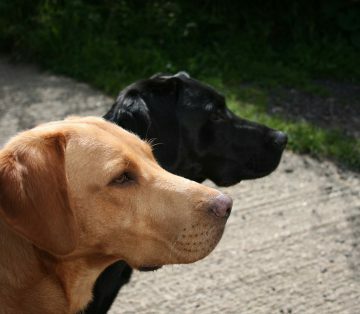 The dogs, therefore, need to be lifted over the fence! Cussing we carry on. 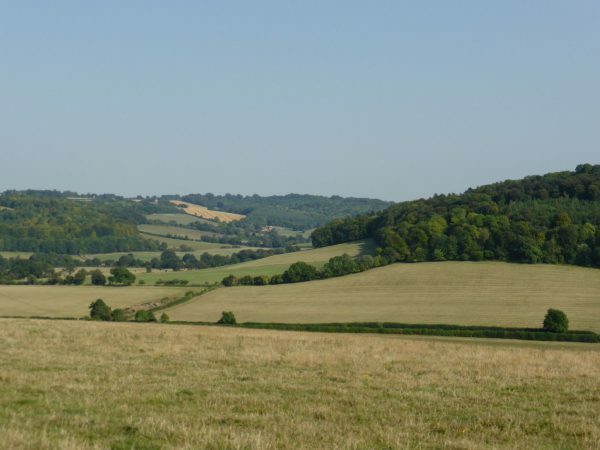 There is recent evidence of bears in the field but we cannot spot them so carry on over the field and then cross a track to go uphill across another field. A number of sheep in this field are limping, we wonder if they have a problem or if the prevalence of spikey thistles is playing havoc with their hoofs, the dogs are certainly wary of where they place their paws. Leaving the field we enter trees and carry straight on to cross a road and join a track on the far side. This tree-lined route soon starts to climb and enter woods and after sweeping to the left has a short steep section. 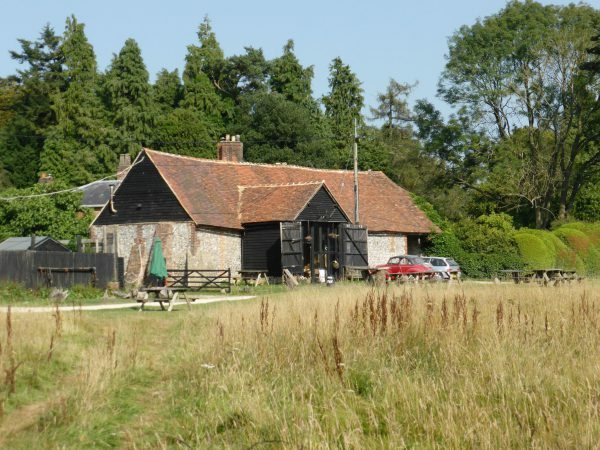 At the top of the hill we emerge onto Turville Heath where there is a cafe in an old barn. We are tempted to stop but realise that neither of us has any money so continue to follow the path across the heath until reaching a road where we turn left. 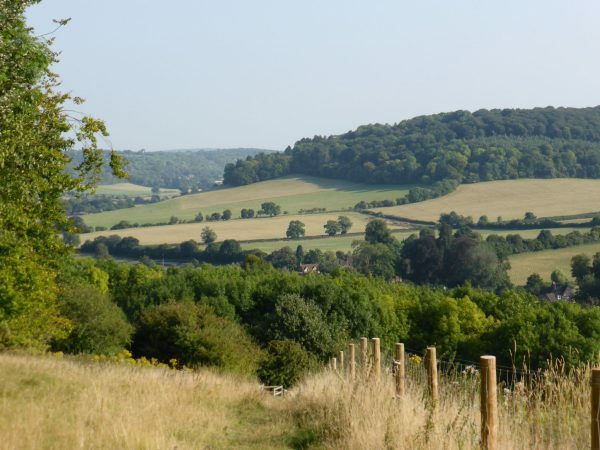 We follow this road, ignoring two turnings to the right, but when the road goes downhill and sweeps to the rights we carry straight on to walk past Turville Court. Going through a gate there is a choice of paths; we continue straight on to walk with the hedge of Turville Court on our right. This brings us to a gate in a field where we continue on for a couple of hundred yards to go through a second gate and then turn to the left to walk diagonally across the field. 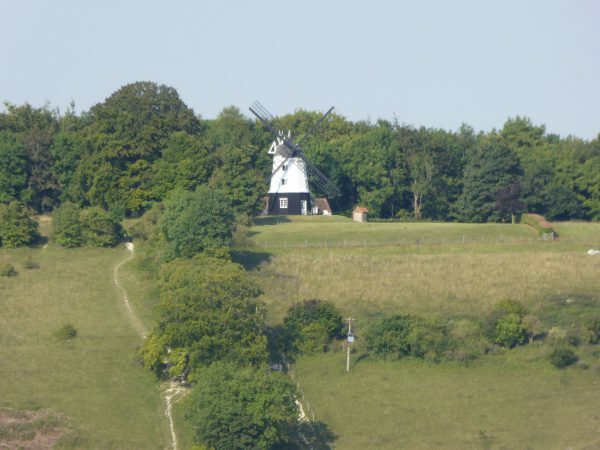 As we descend great views open out in front of us, including a stunning view of Cobstone Mill on the hill opposite. 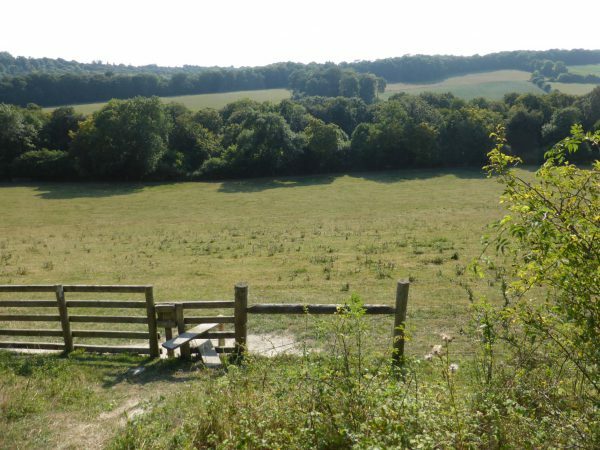 Our route is now downhill to reach a gate where we turn left joining the Chiltern Way, which we follow into Turville. 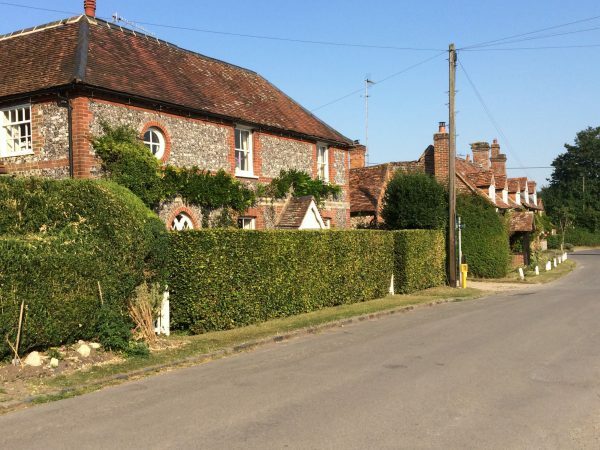 It is easy to see why this village is popular with TV and film companies seeking a typical English village for their productions. We turn left to walk along the road and soon after passing the church we take a footpath on the right which leads diagonally across a field and then after going through two gates enters trees to climb up steps. 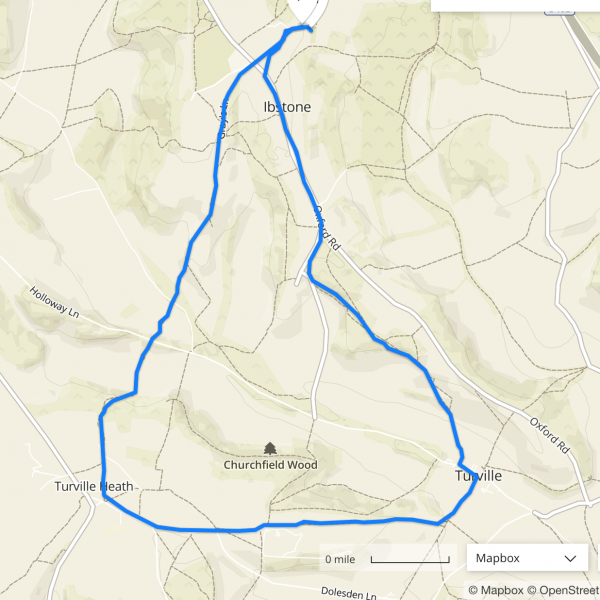 This was the route I took a few days ago. This time I have Lynnie to kiss as we go through the kissing gate. I am not sure if the look that Crosby gives me is one of relief or disgust (when Lynnie is not with us he has to be kissed at a kissing gate!). We follow the path through another kissing gate and then along the top of a fenced field, at the end of the field we turn right and then almost immediately left. On reaching the road we go uphill and follow this to a T-junction where we turn left to walk along the road back into Ibstone. 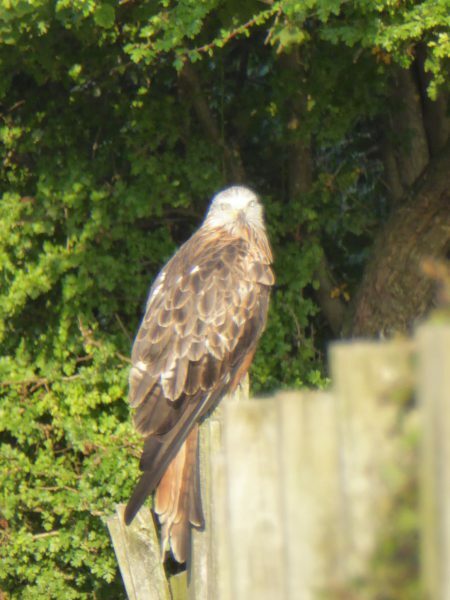 After walking down the drive past the farm we see a Red Kite sitting on a fence post along the track to the CL. 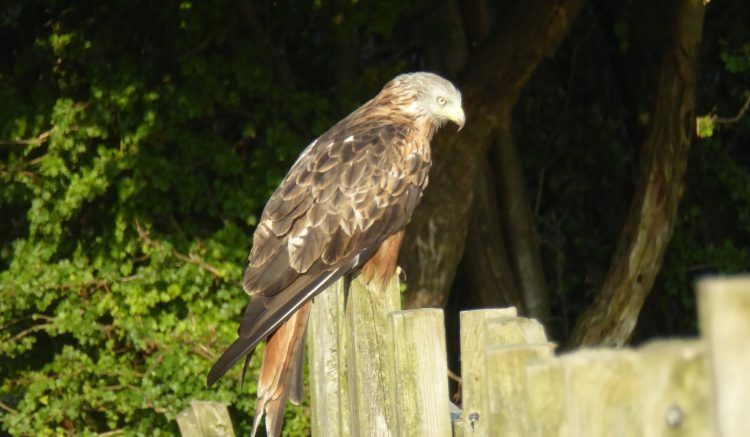 Seeing Red Kites is guaranteed at Cholsey Grange. But we have not previously managed to get this close to one. It is a stunning bird of prey. 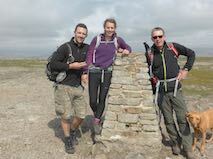 Our walk has covered six miles and has been thoroughly enjoyable. Time for us to water some plants and vegetables in Jackie’s garden after another hot day, before we settle down for the evening. We do enjoy our stays at Cholsey Grange!